CAP01L capping machine represents the entry level for in-line capping machines. Production can reach 1500 pieces per hour. Minimum cost and time for format changes for bottles of different shapes and sizes. Main structure in anodized aluminum profile, completely covered with stainless steel panels. Inlet and outlet conveyor belts with single motorization: adjustable guides in stainless steel and polyethylene. 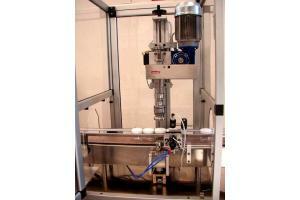 An adjustable pneumatic singularization system transports the bottles in correspondence with the capping head. Feeding caps by vibrating cup, diam. 600 mm and soundproofed. Closing group for plastic or aluminum caps with variable speed and magnetic clutch with mechanical closing torque adjustment. Production: up to 25 pcs./min.